The search for a missing submarine turns up a second-century B.C. shipwreck at nearly 10,000 feet. The discovery of a 2,300-year-old shipwreck between the classical trading centers of Rhodes and Alexandria adds to the corpus of evidence that is challenging the long-held assumption that ancient sailors lacked the navigational skills to sail large distances across open water, and were instead restricted to following the coastline during their voyages. Four other possibly ancient wrecks lie nearby. In the spring of 1999, the deep-ocean exploration firm Nauticos Corporation conducted a survey in the eastern Mediterranean in an attempt to locate an Israeli submarine that had mysteriously disappeared in the area 31 years before. Their sonar system detected five closely spaced anomalies at a depth of almost 10,000 feet on what is known as the Herodotus Abyssal Plain. Visual inspection of these anomalies with a remotely operated vehicle revealed five shipwrecks of archaeological significance. Time permitted the collection of detailed video and sonar imagery at only one of the sites; this information was forwarded to the Institute of Nautical Archaeology (INA) at Texas A&M University to determine that ship's origin and importance. The shape of several amphoras from the site dates the wreck to the end of the third century B.C. or the beginning of the second century B.C., making this the deepest ancient shipwreck yet discovered. Despite its depth, the site is typical for an ancient shipwreck. The vessel came to rest on the bottom and eventually listed over onto its side. In this case, the ship heeled over to port. As its wooden hull lost structural integrity, the ship's port side flattened out under the weight of the amphoras that had tumbled over it. The starboard portion of the hull, held upright because of the list and unburied by amphoras or sediment, succumbed to erosion and decay. 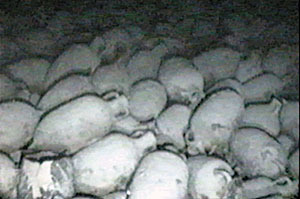 The wreck's amphora cargo forms a more or less oval mound approximately 80 feet long and 50 feet wide and tapers in height and width from the center of the ship to the bow and stern. At least six different types of wine amphoras have been identified, including containers from the islands of Rhodes and Kos; there may be as many as 2,500 amphoras present at the site. The ship's bow area can be identified by the presence of at least five lead anchors. Anchors of the period were comprised of wooden shafts and flukes and lead stocks and fluke supports, or "collars." At least five lead collars and three stocks are still oriented as if they were lying on the foredeck of the ship, the usual location for anchors during a voyage. 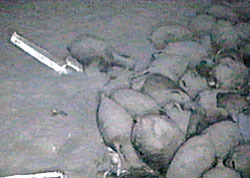 It is not uncommon to find six or more of them on a wreck site from this period, as they required continuous repair and were often lost during use. Crew quarters were usually located in the stern of a ship, and the wreck's stern area contains some kitchen ware, including at least one serving bowl and pitcher. 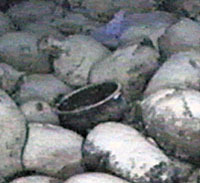 An unusual feature of this wreck is a large, intact metal cauldron that sits upright in the center of the amphora mound. The cauldron has been collecting sediment for more than 2,000 years and is essentially the world's oldest and longest continuously deployed sediment trap. Oceanographers at Texas A&M University are trying to determine if there is a nondestructive method to obtain a core sample of the sediment in the vessel, which might yield information about changes in the Mediterranean Sea over the last two millennia. The great depth and cold of the sea may even have preserved a portion of the ship's hull. Two small wooden members--a frame or deck beam and a small segment of thin planking--protrude from the sediment at the edge of the forward-port area of the wreck. They appear to be well preserved, which makes the possibility for preservation of the remainder of the port side of the vessel promising. That there are four other possibly ancient shipwrecks in close proximity to the site is extremely interesting. If the wrecks are all from the same general time period, they may provide detailed information about long-distance trade over open water at a specific moment in history. 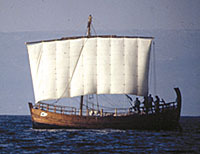 If the wrecks span many centuries, they may provide new and important evidence about trade between Crete, Cyprus, Turkey, and Egypt, over a broad span of time. This would be the first evidence of sustained open-water traffic in the ancient world. The wreck lies at the midpoint along a line drawn between the ancient trading centers of Rhodes and Alexandria. Based on the wreck's location and its cargo of Greek wine, archaeologists speculate that the ship was bound for Egypt when it sank, either as a result of a structural failure or having foundered in heavy seas. Closer study of the amphoras and ceramics hopefully will yield a more precise date for the shipwreck. INA and Nauticos are discussing the possibility of returning to the site to carry out a detailed study, as well as to explore and date the four other wrecks in the immediate vicinity. For more information, visit the Nauticos website at www.nauticos.com. Brett A. Phaneuf is an Institute of Nautical Archaeology research associate specializing in remote sensing and deep sea technology. Thomas K. Dettweiler is executive vice president and director of operations for Nauticos Corporation. Thomas Bethge is ocean projects manager for Nauticos Corporation.